People often ask me for healthy breakfast ideas. Even though I eat the same thing nearly every day (see Kelly’s daily oatmeal), the good news is that there are plenty of nutritious options for the morning meal. 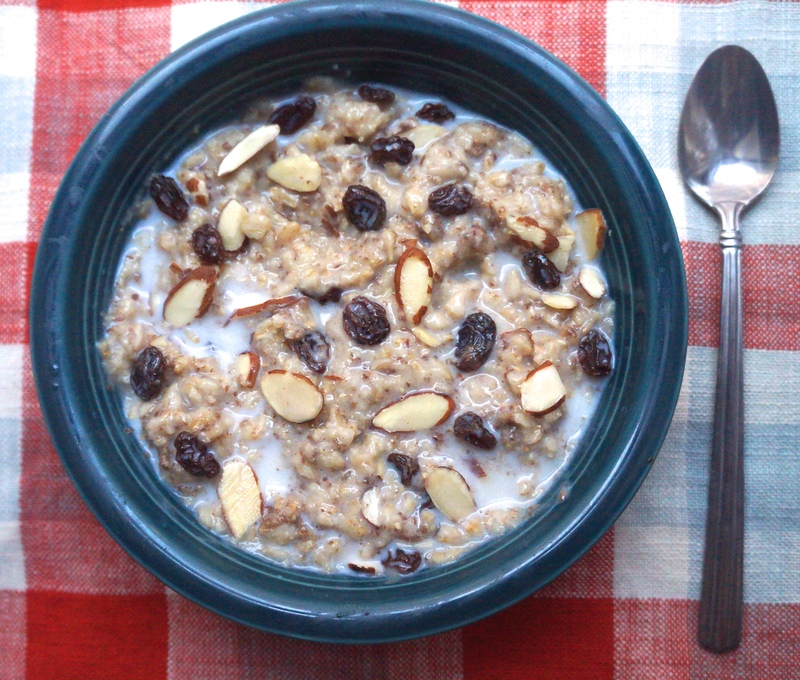 Nine times out of ten, I start my day with old fashioned oatmeal topped with raisins and almonds (see this post for details). Porridge is an ideal breakfast because it’s filling, quick to prepare, and helps keep your cholesterol levels in check and your microbiome happy. (And whether you go for steel-cut or instant, all oats are whole grains.) Plus, oatmeal can be customized to fit just about any flavor profile. If you’re ready to branch out the classic combo pictured above, try adding bananas, blueberries, honey, peanut butter, pumpkin puree, cocoa powder, or chia seeds. The sky is the limit! See one of my favorite blogs, The Oatmeal Artist, for more ideas. 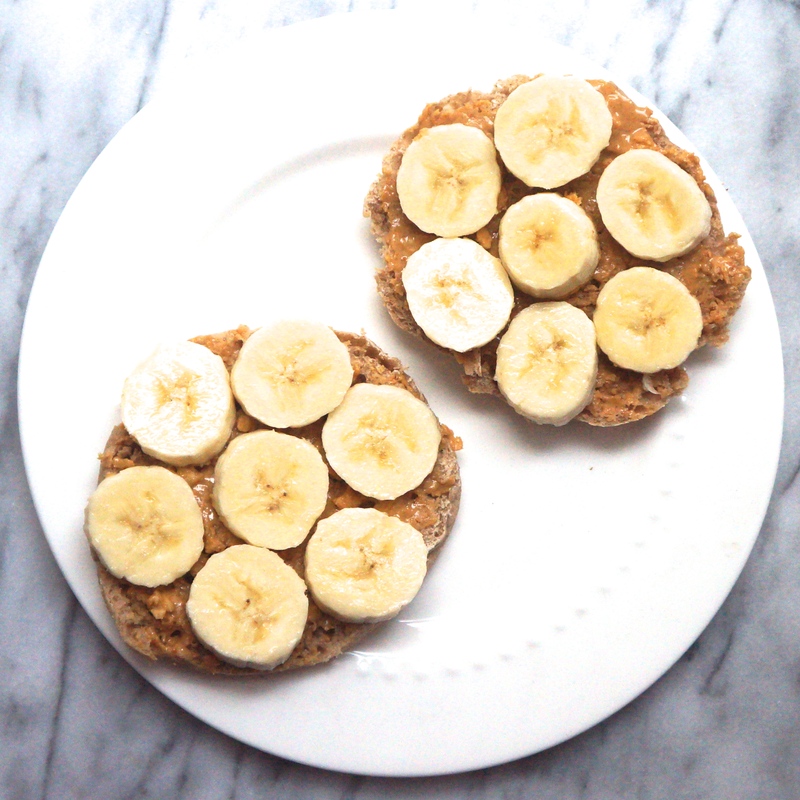 One of the easiest breakfasts just got easier. 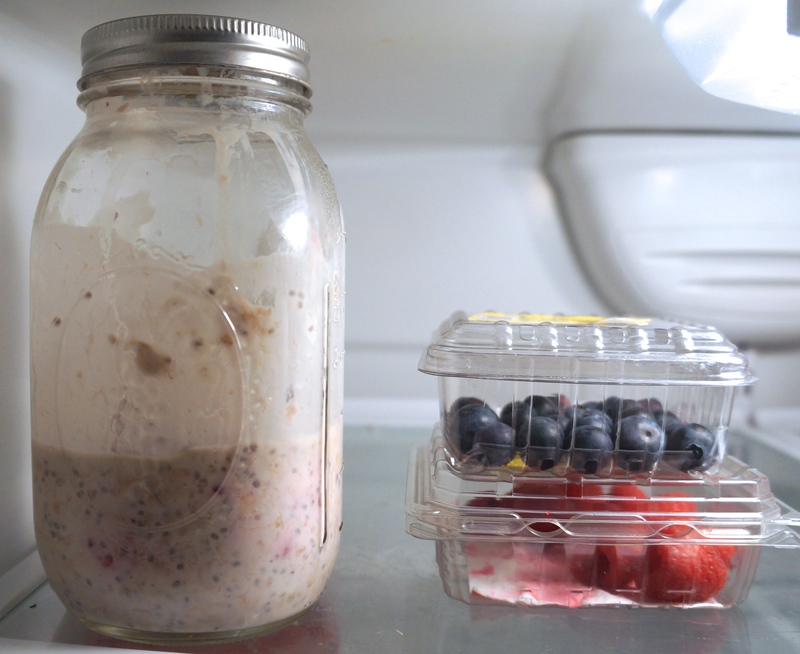 Instead of preparing your oatmeal morning of, you just throw the ingredients in a jar and let the oats soften overnight. See my Banana Berry Overnight Oatmeal blog post for a step-by-step tutorial. Once you get the ratio down, feel free to experiment. 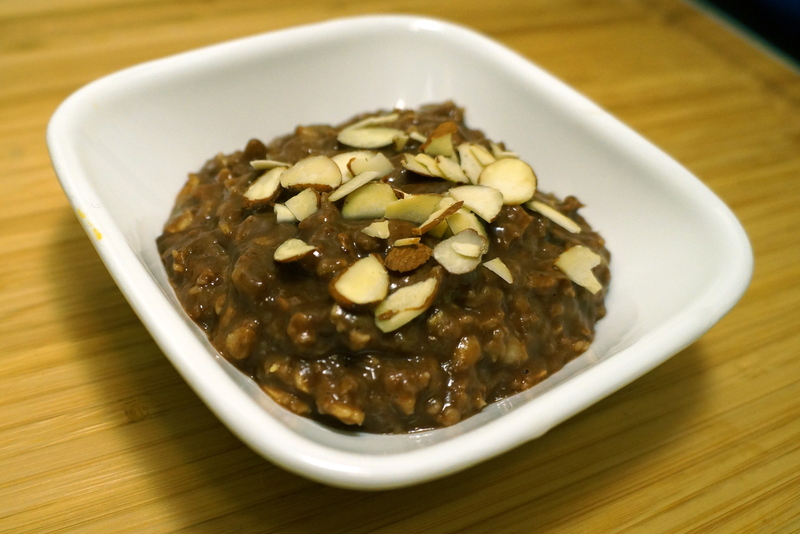 Some of my favorite overnight oatmeal recipes are Skinny Pumpkin Overnight Oats, Tiramisu Overnight Oatmeal, Applesauce Overnight Oatmeal, and Overnight Grapefruit Coconut Oatmeal. Because some mornings call for chocolate. Right? Right. 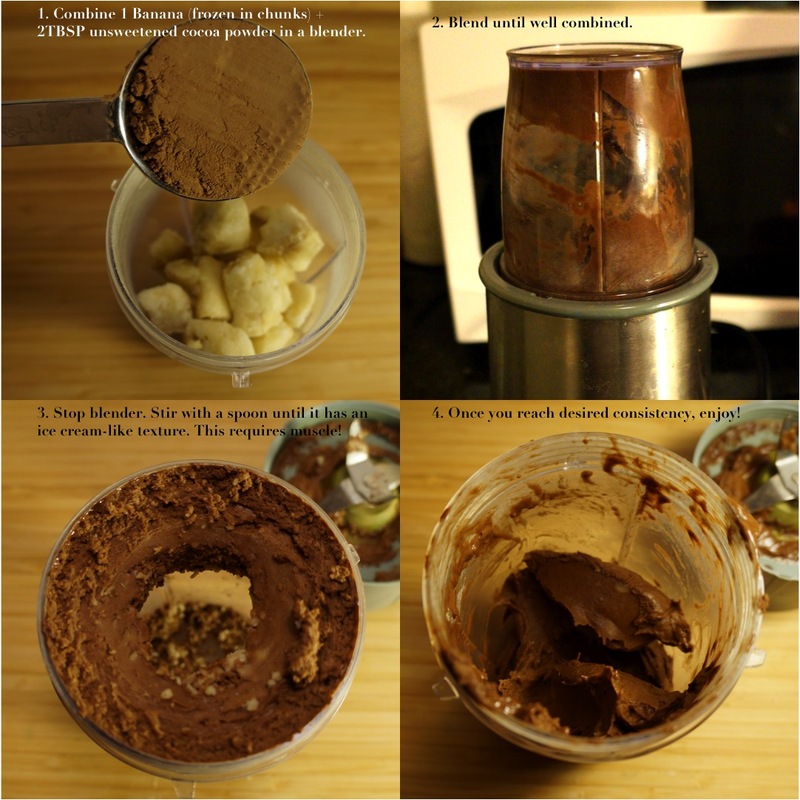 Just blend 1 frozen banana with 1 Tbsp PB, 3/4 cup of milk, and 1 Tbsp unsweetened cocoa powder. With protein, healthy carbs, and healthy fats, this shake has all major nutrients needed to start your day off right. 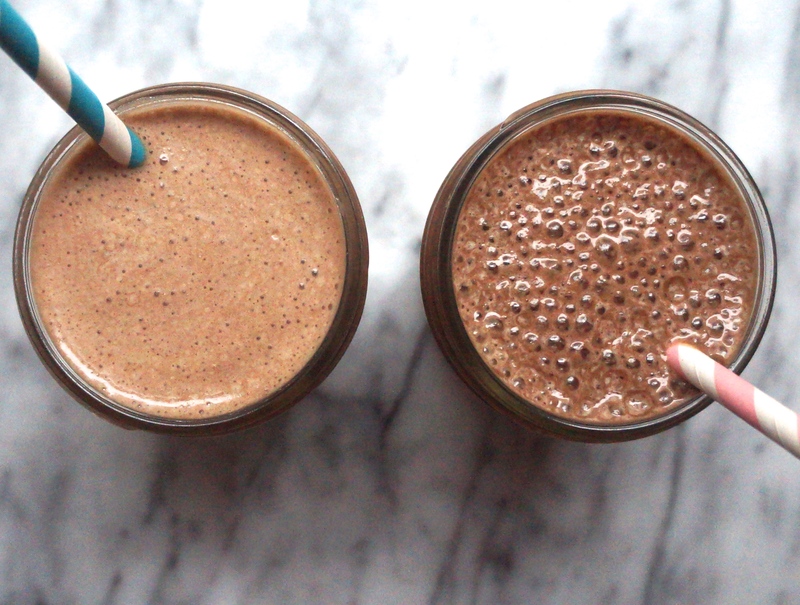 For more details, and to see an equally healthy Dark Chocolate Mocha Milkshake recipe, check out this post. While the obnoxious whir of a blender is not what I want to hear first thing every morning, green smoothies are a great choice for many reasons. They’re portable, nutritious, quick, and easily customizable. Note that I said smoothies, NOT juices. My favorite green smoothie recipe is a fresh banana, 1 cup frozen strawberries, a large handful of fresh spinach leaves, and 1/2 cup nonfat plain Greek yogurt. (I don’t use ice because of the frozen berries). 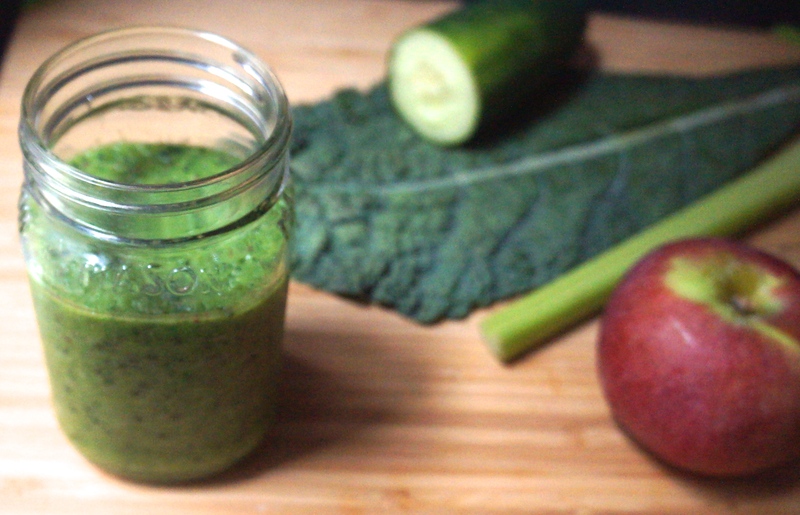 I also highly recommend this “Stripped Green Smoothie,” which I make when I have the ingredients on hand. 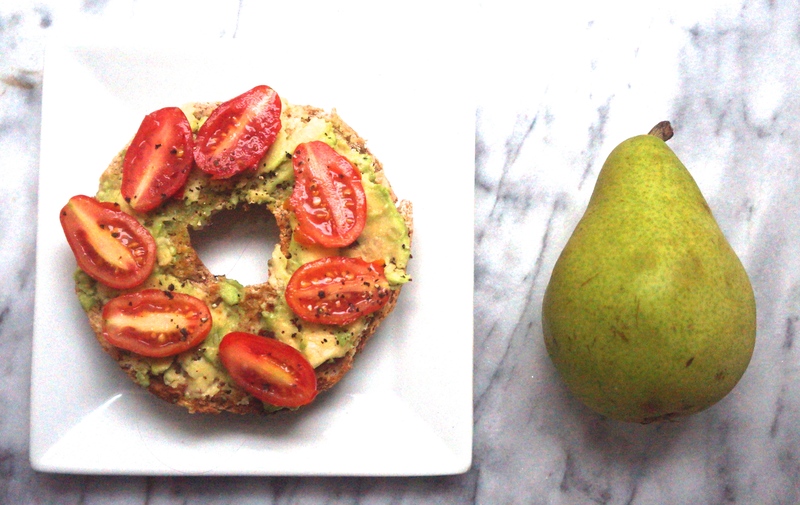 Toast half of a whole wheat bagel, then spread with avocado, and top with tomato slices and cracked black pepper. 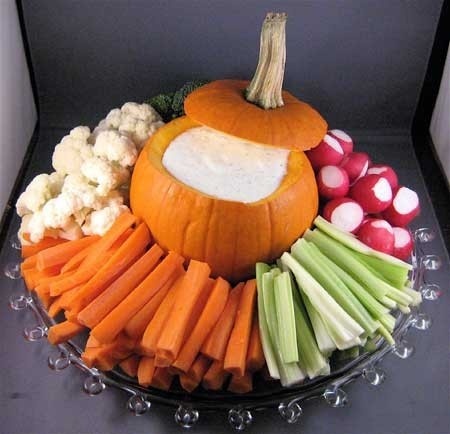 Serve with a pear (or any fruit) on the side. The healthy way to enjoy a bagel is to pick a whole wheat bagel, only eat half, and top it with something nutritious. Yes, avocado has fat, but not the artery-clogging saturated fat that cream cheese is made of. And by only having half of the bagel, the portion size is much more appropriate. 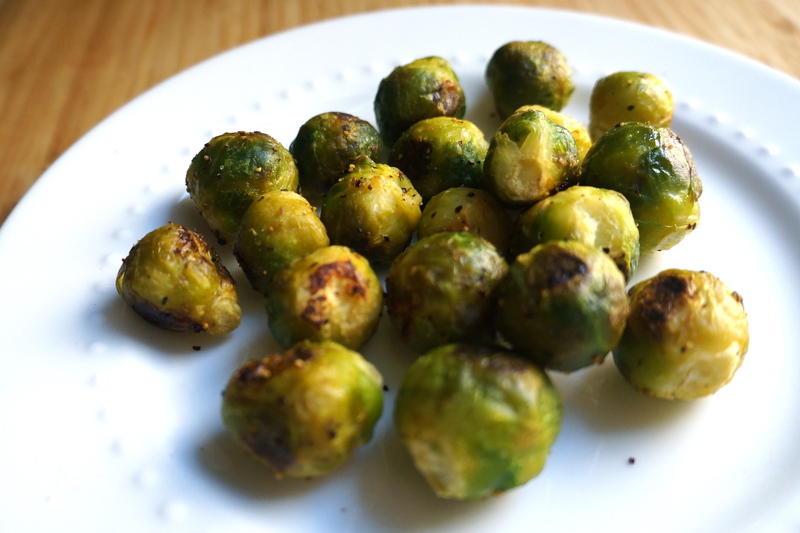 Got leftover roasted vegetables? Nuke ’em in the microwave, then top with 1 egg, any way (or scramble them with the egg). 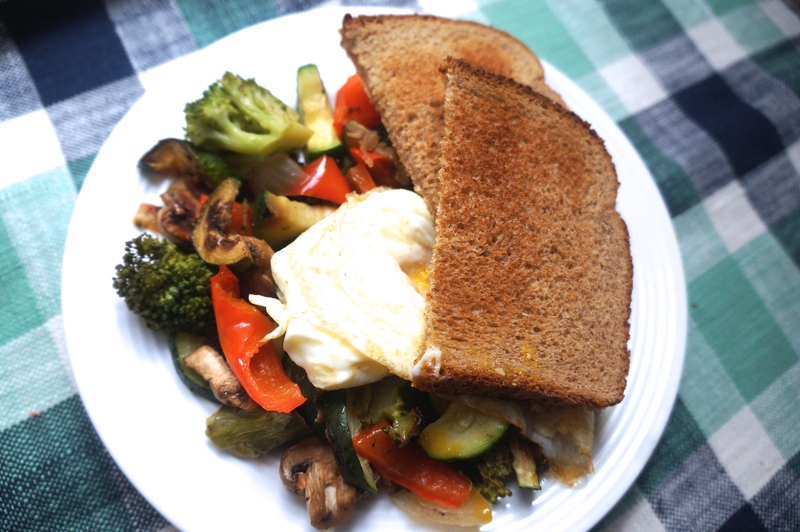 Serve with a slice of 100% whole grain toast. Granola parfaits can be a total calorie bomb, but not if you do it right. The key to keeping this healthy is to use an unsweetened yogurt (I used Stonyfield Farms Organic Nonfat Plain Greek Yogurt) and using a lightly sweetened granola (the wheat-free classic granola from Whole Foods Market is totally #dietitianapproved!). Bananas and figs go great with yogurt and granola, but any fruit will do! English Muffins are perfectly portioned, which is why I prefer them to regular bread slices or bagels. Just make sure to get a whole grain variety. And when shopping for peanut butter (or almond butter), make sure that the only ingredients are nuts and salt, with no added sugars or oils. Top chopped fruit with a generous dollop of part-skim ricotta and cinnamon. This tastes best with leftover baked fruit (I used a mixture of apples, pears, peaches, and pineapples), but fresh fruit will work as well. I have also microwaved a soft pear and achieved similar results. Don’t have ricotta? Cottage cheese is another great substitution. 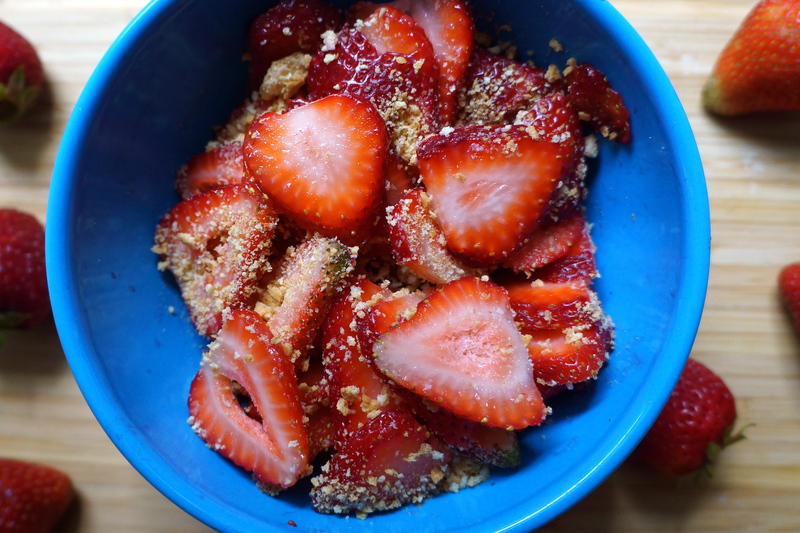 This dish (which was inspired by a Giada recipe) also makes a delicious dessert! Want a sure-fire way to guarantee a nutritious breakfast? Make it the night before! This Baked Blueberry Oatmeal is my very favorite breakfast bake (and bedtime snack! ), but healthy muffins or quick breads are also great make-ahead meals to tackle on weeknights, rather than weekday mornings. 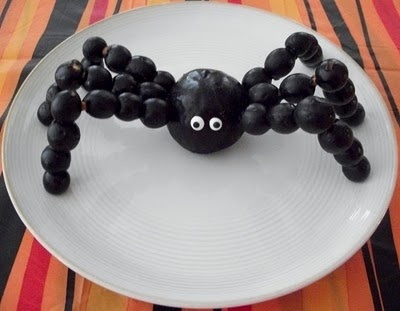 Fruit is bad because it has so much sugar, right? Shouldn’t you cut back on fruit if you’re trying to lose weight? I get questions like this all the time. No seriously, I do. While it’s upsetting to think of how the media and food faddists have led well-meaning dieters astray, it’s actually pretty liberating when friends and clients realize just how easy good nutrition is. More fruits and veggies, less junk food. It’s that simple! Think about it logically. America doesn’t have an obesity problem from eating too much fruit. It’s our ever-increasing portion sizes, penchant for sugary beverages and endless snacking that did us in. Yes, fruit has sugar. But it also has loads of vitamins, minerals, water, and most importantly, fiber. The fiber in the fruit will slow its release into your bloodstream, so that you don’t get the spike and crash associated with other sugary foods (such as soda or candy). However, do not confuse fruit with fruit juice. Juice lacks the fiber and some of the micronutrients of the whole fruit. While a cup of fresh fruit is a healthy, low-calorie snack, do not be fooled into thinking that juice is a low calorie or no calorie beverage. Many juices pack just as much sugar and calories per cup as soda. And without the fiber (and additional water in whole fruits) to trigger fullness cues in your stomach, it is much easier to overindulge in fruit juice than fruit. Additionally, the amount of juice you drink has a direct relationship with diabetes risk, but the amount of fruit you eat actually decreases the risk of diabetes. Next time you find yourself unsure of what to eat, remember the sweet truth and fill up with fiber-rich fruits and vegetables. As a dietitian, I try to keep my consumption of added sugars as low as possible. And I’m not just talking about table sugar here. I’m talking about brown sugar, agave, maple syrup, and yes, even honey. The American Heart Association recommends no more than 6 teaspoons of added sugars a day for adult women, and no more than 9 teaspoons for adult men. If you are looking to keep added sugars to a minimum, dates and mashed bananas become your best friend. First, a little primer on dates. Dates are kind of like giant raisins, but much more sticky and much more sweet. They are about 20 calories each. I usually buy pitted medjool dates in the bulk section at whole foods (surprise, surprise). However, on a particularly desperate grocery outing, I was able to find dates at the little international market next to my apartment building. Score! Some of my favorite recipes call for chopped dates as a sweetener, but because the dates are chopped, I find that the sweetness doesn’t distribute evenly throughout the final product. This leaves me with unsweetened food with chunks of date… not quite what I was looking for. Plus, who wants to meticulously chop up a sticky fruit every morning? Not me! Which brings me to date paste. Date paste is a simple idea really. Just soak dates overnight, blend the softened dates (I used a knock off Magic Bullet) with a bit of the soaking water, and voila… you have a sweetener that distributes much more evenly throughout. 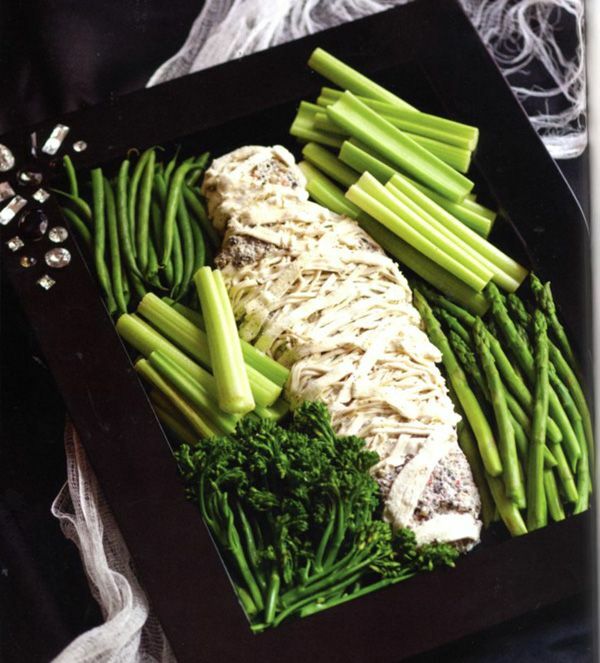 (For a more descriptive recipe, see here). 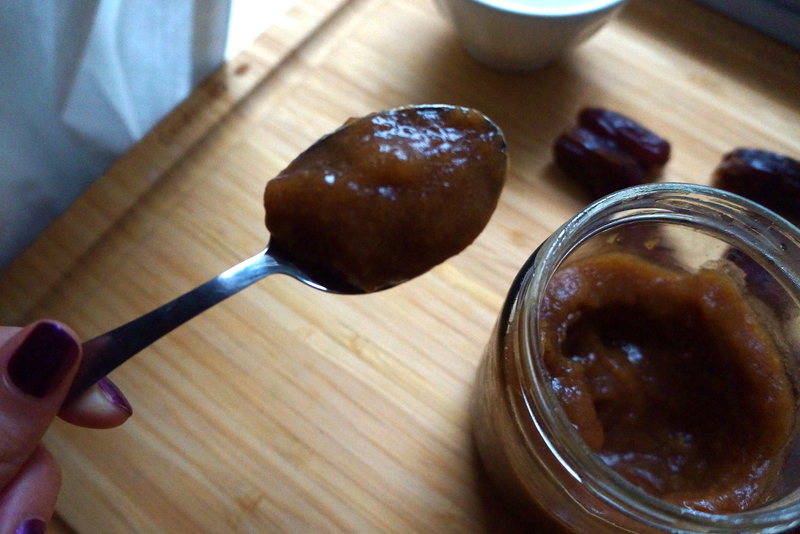 I usually substitute 1 tablespoon of date paste for every teaspoon of table sugar that I would have used. I mostly only use date paste in my morning oatmeal, but it also works great to sweeten muffins and other treats. 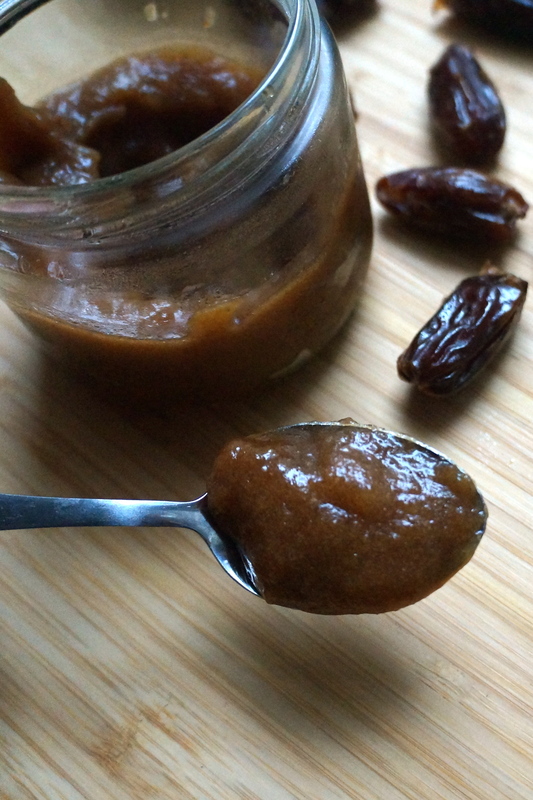 1 tablespoon of date paste has approximately 25 calories, 6g sugar, and 0.5g fiber. 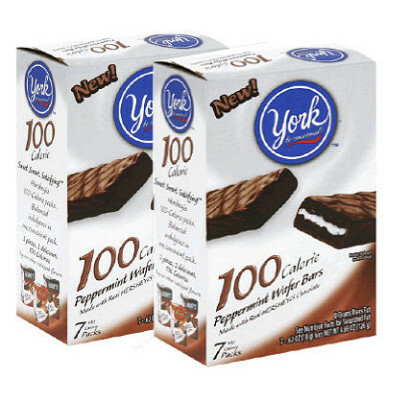 Compare that to the 16 calories, 4g of sugar, and 0g fiber in only 1 teaspoon of table sugar. Not bad! 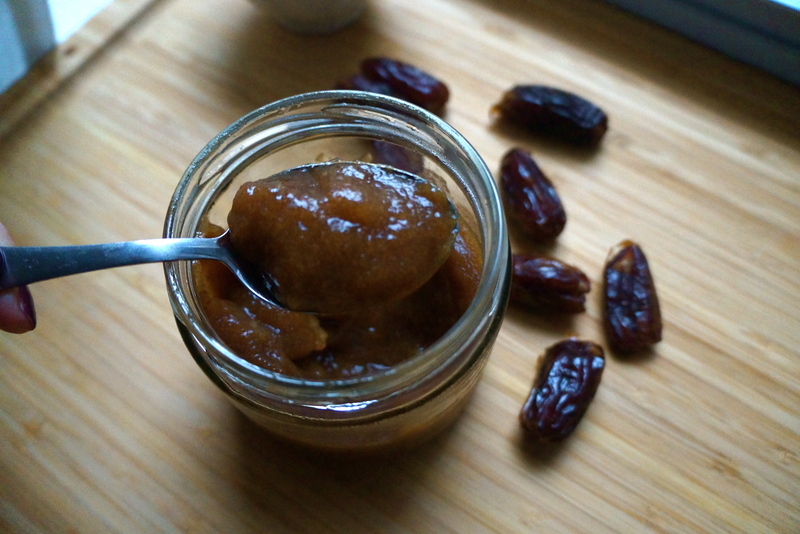 Have you made date paste? What are your favorite healthy sweeteners?